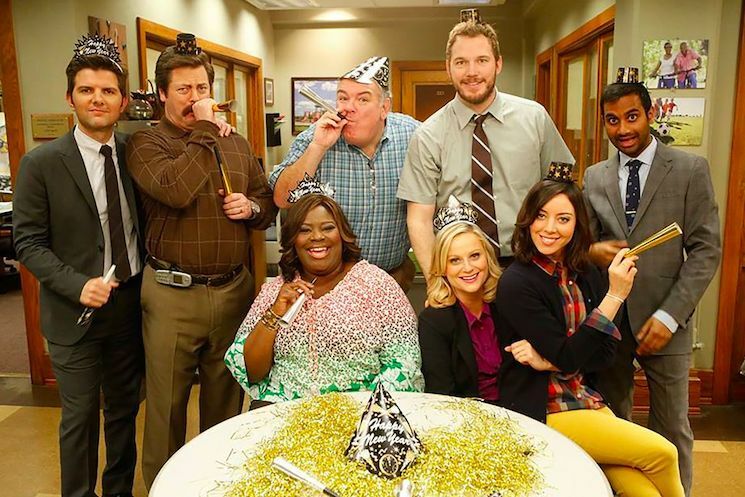 Michael Schur's Parks and Recreation has lived on in the public's hearts — along with memes and reaction GIFs that could rival his other show The Office. As with everything beloved by viewers, there's now talk of a possible reboot. At least, one day. Last night (March 21), the entire cast of the show joined forces to celebrate the 10 year anniversary of their premiere at the Dolby Theater in Los Angeles. This means Amy Poehler, Nick Offerman, Adam Scott, Rashida Jones, Aziz Ansari, Aubrey Plaza, Chris Pratt, Jim O'Heir and Rob Lowe were all there. The talk was moderated by comedian and former Parks and Rec guest Patton Oswalt, and during the reunion, Schur said the door is still open for a reunion. "I think in the world we live in now nothing is ever gone," Schur told the crowd [via IndieWire]. "I think everyone on this stage — and like six other people — would have to feel like there's a story that needed to be told. What I felt personally, the show had an argument to make and the argument was about teamwork, friendship, positivity, being an optimist… and believing people can do good and the power of public service, and that with good people around you… good things are possible... I don't feel like we left anything on the table, really. I feel like the show made its argument." Schur added that he wouldn't just want to make new episodes for the sake of making them. "It felt like the most important thing I would ever do," he said. "So I would never, ever, ever say never — the chance, should it arise, would be incredible — but as tempting as it is, I don't want to make more episodes just to do it." Further, every cast member would need to be involved. "I would say we would do it if literally every person says yes," he concluded. "If one person says no, we shouldn't do it." Check out a picture of the reunited cast below.